We all know that floods have been there even much before the humanity came in to existence. They were one of the reasons to drive the nomadic man to take shelter in the caves, perhaps the beginning of the concept of dwellings! Seeking protection against floods has also been an age old practice, but now time has come to understand the causes of floods and how to obviate them. Prof. K.S. Valdiya, a renowned scholar of geology enumerates three major causes of floods in flood plains of India in one of his publications. When the magnitude of water exceeds the carrying capacity of the river channel, the excess water flows out along a flood pathway or the natural passage of the highest discharge. Under normal circumstances things remain quite calm and river appears to be placid. Heavy prolonged rains with cloudbursts lead to excessive discharge in the rivers. Sometimes these accompanied by excessive ice and snow melt make the situation worsen. However, fortunately such incidences are rare. Dams, natural or artificial sometimes burst and lead to great misery downstream. In one of the articles I have already described the huge landslide of 1893 on Birehi Ganga in Garhwal when a whole spur of a mountain slid down the river. Breach of this dam later caused a havoc upto Haridwar. That was history. In between several devastating events of damming of Himalayan rivers by landslides and subsequent breaches have caused flash floods. Pune in the Deccan Plateau was deluged in 1961 when dams at Khadagvasla and Panshet on Mula river collapsed. A dam across Machchu river in Saurashtra failed in 1979 and 1479 people of Morvi town lost their lives in the floods. Palang Zambo River, a tributary of Brahmaputra was dammed by a landslide. A lake was formed. On 20th June, 2000 this 130 m high dam breached and the resultant floods in Brahmaputra took 30 lives and 50,000 people were rendered homeless. Similarly in Bhutan in 1994 Lugge Tso, a glacial lake burst. The gushing waters heavily damaged a hydroelectric power plant downstream at Namche. Sudden ice melting caused a lake burst in near Lunana area of Bhutan again in 1994. Lake bursting due to ice melting is a rare occurrence. But it is a hazard that one must keep in mind. The erratic urban development by not following the thumb-rule of leaving the floodway or the flood pathway of the river free from obstruction is one major problem. A floodway conveys its highest discharge once in a hundred years of floods, with one percent chance or recurrence when the water-surface elevation does not rise to more than a foot above the floodway at any point. This means floodway is the part of the valley which experiences one foot inundation by flood-water once in hundred year period. Floodways are important because they ensure relief from floods. Alas neither the government not the people bother. Human memory as I have often repeated is volatile. A hundred years is too long a gap. With bunds on the banks of rivers the government and the society presume that now the river can not reach them. But when there is a recurrence after a hundred years, both are taken unaware. Floodways have to be respected and left untouched if we care for the posterity. Despite the hue can cry by the environmentalists to protect the forests in the catchments of the rivers, hacking of forests continues unabated albeit unofficially. This leads to accelerated erosion and excess surface runoff of rainwater. Normally a large part of rainwater is retained by the humus of the well forested ground. This water gradually seeps to subsurface. On barren slopes rainwater just flows down to the valley sweeping off everything lose in its wake. This adds to the water volume of the river. The eroded material dumped in the river reduces the carrying capacity of the river. Net result is more floods. Not only hacking of forests but even burning or overgrazing of forests in catchments augments the process of erosion. V.V. Dhruva Narain an agronomist published a paper in 1997 based on a case study carried out in an experimental farm at Dehradun that clearing a forest resulted in increase of volume of runoff by 15% and the peak discharge of streams by 72%. A stage has reached when more than 80% land in the country is bereft of forest cover. Naturally the severity and frequency of floods has increased despite reduction in average rainfall. The reasons of flooding are now amply clear. The next step is to reduce the fury of floods. Treating the watershed is one way of reduction on a long term basis. Regenerating a forest cover takes about hundred years. But there are means other than afforestation, which include reduction of surface runoff of rain water by cultivating vegetation that produces plenty of litter and also by digging trenches, pits and wells to induce percolation of water to depths. This will have a double benefit-while the fury of the flood will be reduced the ground water recharge will be augmented. Apart from various civil construction measures like building embankments along the rivers, channelising flood water etc, a significant way is to strictly implement floodway regulations. Precise identification and marking of floodways is important for this measure. Land use on the floodways has to be kept under strict check and no concession permitted. It will be enlightening for the readers that the floodway of the Yamuna River in Delhi has already been well encroached. In case the river swells then the consequences are anybody's guess! In this age of fast communication network there is a dire need of a real time flood prediction and forecasting with facility of real time warning stations. In the 62 major river basins of India there are 132 watershed-level forecasting centers, and 25 inflow forecasting units. 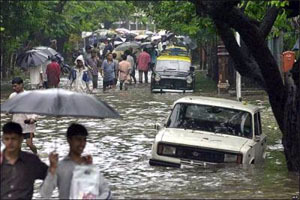 It is an irony that more than 75% of annual rainfall takes places within 100 hours during the monsoon. Forecasting network has to be so widespread that it can catch up with the onslaught of the rains during these 100 hours. A stitch in time saves nine goes the saying. In case timely warnings are issued and people evacuated, at least lives can be saved if not the property. It is time that people and the government seriously think of safety from the floods, instead of considering as the 'god's will'. Geohazards are part and parcel of our environment. We will read more about them including the dreaded tsunamis in the coming issues.